Whether you are well-connected or not, getting funding for your bright idea could soon become easy. According to Massolution, crowdfunding is about to outstrip venture capital funding. The company’s Crowdfunding Industry Report projects that funding a project through the Internet with sites like Kickstarter and Indiegogo could take over by the end of 2016. * Funding has become lightning-fast - While angel funding or securing a business loan usually takes several months, it could take around a month or even a few weeks to achieve your target with crowdfunding. Indiegogo claims that the average length of a campaign is between a month and 39 days. * Lending has been disrupted - By connecting everyday people with companies trying to launch a service or product, crowdfunding has taken the startup world by storm. Conventional lenders have had to start shifting perspective to keep up with how the evolution of crowdfunding is affecting their business. * Instant feedback - Entrepreneurs can sink their life savings and more into their business long before they form an understanding of their target market. With crowdfunding, they have the unique opportunity of finding out what the core audience thinks before spending a penny. * An instant fan base – While an angel investor might be excited about your venture while funding you, it is not doing anything to develop a following. Crowdfunding streamlines the process and connects startups with an enthusiastic fan base that ready to fund them and spread the word. * Enhanced marketing – There is a direct link between increased funding and the speed at which it happens based on how well a crowdfunding page is marketed. Crowdfunding and social media go hand in hand, and social media is a critical component in contemporary marketing. * Reaching a global audience – Time and resources are limited while raising funds. With conventional funding, it is unlikely that startups would pitch to investors from around the world. 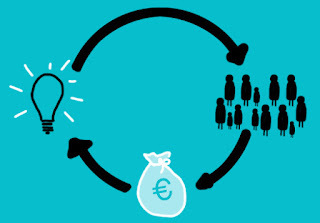 Crowdfunding brings the world closer and drastically increases potential investors in terms of diversity and resources. Will Crowdfunding Surpass Venture Capital in 2016?